WITH the first sunrays in the morning, mouse-ear cress raises its leaves and then lets them droop as the sun sets. Just like honeybees know when to set out to collect nectar. Most organisms have a built-in clock that regulates their biological functions on a roughly 12-hour schedule. Though researchers have identified genes that follow the circadian clock, what gears the clock remained unknown, until now. Plant physiologist Marcelo Yanovsky of Leloir Institute Foundation in Buenos Aires recently discovered an enzyme that acts as the timekeeper. Yanovsky and his colleagues introduced random genetic mutations into mouseear cress (Arabidopsis thaliana) to induce different growth patterns in them. 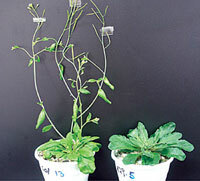 For example, growth in a normal cress plant is retarded by light. But some mutants continued to grow in light and became taller. The scientists analysed the plant genome to find the mutated genes that altered the circadian clock. The screening revealed a mutation in prmt5—a gene that regulates transcription and post-transcriptional processing of RNA; the processing is the precursor to protein expression. The gene makes an enzyme that can add methyl groups to histone proteins—proteins that bind DNA to pack it into the nucleus of cells. The addition of the methyl group causes DNA to pack more tightly and shuts down gene activity. PRMT5 enzyme also adds methyl groups to proteins that regulate post-transcriptional processing. Molecular analysis showed this activity of PRMT5 enzyme causes significant changes in expression of circadian clock genes: the genes expressed at night get suppressed and the ones that are turned on during day get expressed at higher levels. This is the first time an enzyme, a methyl transferase, has been shown to regulate a circadian clock. The scientists did a similar experiment on fruit flies and found an enzyme similar to PRMT5 in them. DART5 regulates circadian clock in flies. “This shows though most parts of circadian clocks differ between plants and animals, the way the clocks are geared is similar,” Yanovsky said. This could be because of convergent evolution, he added.